What happens during the most commonly practiced procedure used to treat carpometacarpal osteoarthritis? Once the trapezium bone is removed it will leave a large gap between thumb and wrist joint. What happens next? Where does the cut run? What are the advantages of this surgical approach vs the implantation of an artificial joint? What are the disadvantages of this surgical approach to rhizarthrosis? Can surgery on carpometacarpal osteoarthritis be performed as outpatient intervention? Step one of the procedure serves to remove the trapezium bone. 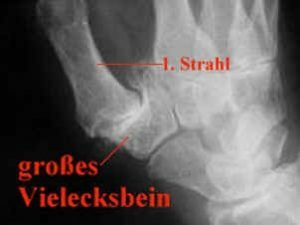 The trapezium bone is the one on which the first extremity sits in the wrist joint area. It is also the bone which becomes affected with osteoarthritis (“wear” of the cartilage). In removing this bone the arthrotic mutation – the damaged cartilage – will be eliminated as well. Without further procedure the first extremity (thumb) would sink into this gap. In order to avoid this, step two of the procedure requires the separation of a section of a large tendon which in turn is pulled through the drill hole at the first extremity to seal the gap. 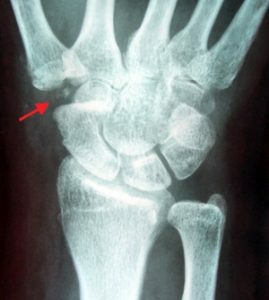 The x-ray on the left was taken after the procedure. It clearly shows the “gap” after the removal of the trapezium bone. The thumb however does not “slide” into the gap as it is fixated with a section of a large tendon. Incision for a procedure on carpometacarpal osteoarthritis. There a different options to access the thumb saddle joint. The image only shows one of the possible options to reach the thumb saddle joint. There will be no foreign material left in the body with this approach. Once the final result of the procedure has been obtained (approximately nine months later), likelihood to retain the result is fairly large since no artificial wear or breakage must be feared. Reaching the surgical target takes considerably longer with this approach in comparison to the use of an artificial joint. The procedure certainly constitutes considerable strain on the hand. Patients often require strong pain killers during the first night after surgery which are best administered by infusion. The guidelines of the German Society for hand surgery recommend an inpatient care approach for these procedures.